I don't think anybody really needs an excuse to wear a bright red lip, but if anything, Christmas is definitely the season! Red lips and the winter go hand in hand for me, and seeing as Christmas Eve is literally right around the corner, I just have to share with you my five festive lipstick picks to give you the ultimate pout for any Chrimbo occasion. Now, the reason I love red lipstick in general is that it tends to suit every person that puts it on, making it the perfect Christmas present, as well as just being generally fabulous. I've tried to include different types of red with various undertones, to cater to as many skin tones and faces as I possibly can with only five lipsticks! My all time favourite red, as you can probably tell by how used up it is, has to be MAC's Russian Red. It is the most beautiful cool, blue toned shade and is my go to for a pop of festive colour. Because of its blue undertones, it's great at making your teeth look pearly white - what a bonus! 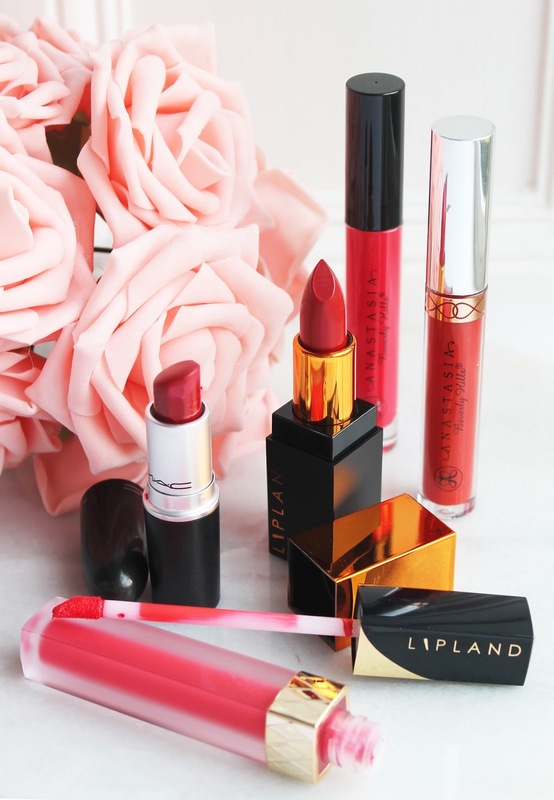 Lipland cosmetics are a recent discovery of mine, ever since their collaboration with the insta goddess which is Amrezy, I've been hooked. Here I have two options from them, a liquid lipstick in the shade 'Brooklyn' and a cream lipstick in '23 Red'. Brooklyn definitely has a pink/orange hue to it, and is extremely bright for anybody who loves to go the extra mile with their lip colour. 23 Red however is a classic cranberry shade, extremely similar to Russian Red, actually. And last but definitely not least, are my two picks from my all time favourite, Anastasia Beverly Hills. Their liquid lipstick in 'Bloodline' is absolutely stunning (see it in action here. ), it's basically the liquid lip, extra matte version of Russian Red and I'll probably shed a tear when it runs out. I've never really been a gloss kind of girl, but recently I think ABH has got me converted; their glosses are incredibly pigmented, non-sticky and so comfortable on the lips. This gloss in 'Socialite' is my favourite! I reckon Bloodline is going to be my colour of choice this christmas eve..
What lippy are you going to be rockin'? I love red lips this time of year! NARS Cruella is my current fave, but all of the ones you've featured look so pretty! Bloodline is gorgeous, I think I need it! I'm definitely going for a red this Christmas and I think it'll have to be Russian Red. It's a classic! I love a good red lipstick! <3 Bloodline loos stunning! My next liquid lipsticks to try are by ABH! I definitely need that 'Bloodline' shade, oh my god! red lips are just a must for the festive season. russian red is my favorite too. i love adding the mac pro longwear lip glass in driven by love for some festive shimmer.